Just Say No to Food Fights! This week, I had similar conversations with several clients about their “picky” dogs. Most dog owners have the opposite experience: their Fido will eat anything, anywhere, anytime (including trash, inanimate objects like socks and grossly unappealing items like deer feces.) This is true for most dogs; we have domesticated dogs in virtually every way, but not their appetites. However, a small percent of dogs are simply not food motivated, and may not eat every food or every meal offered. 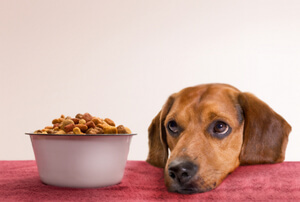 When Fido turns his nose up at a new food, or decides he doesn’t like the same food that he’s been eating for six months, this can be a source of great consternation for clients. 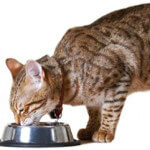 What to do if Fido won’t eat? Certainly, the first thing to rule out is whether Fido has an underlying medical condition that’s affecting his appetite. If Fido has severe periodontal disease, gastrointestinal disease or any systemic illness such as kidney or liver failure, this can obviously affect his appetite. Sudden decreases in appetite should warrant concern, and a call to your friendly neighborhood veterinarian. There is a significant difference between the typically ravenous Labrador who suddenly stops eating (which is a major concern) and the tiny Yorkie, who has turned her nose up at every food offered since she was 8 weeks of age (which may be frustrating, but not indicative of a major medical problem.) This article is intended to address the latter issue. Toy breed dogs are notoriously picky eaters (Yorkies, poodles, Chihuahuas, and Shih Tzus are frequent offenders in the picky eating department). Some large breed dogs can also be selective about what they eat (German Shepherds come to mind as a non-food motivated large breed.) Dog owners often try to stay one step ahead of their picky Fido, with frequent trips to the pet store to try different flavors and brands of food. Other owners begin adding tasty “incentives” to dog food, such as cheese, meat, broth or gravy, in the hopes of tempting Fido to eat. While there is absolutely nothing wrong with periodically changing dog foods, or adding an occasional table food “extra” to the food bowl, these seemingly small changes can ultimately create a food monster. Essentially, Fido will learn that, if he doesn’t eat, he will get something better or different. Our canines are incredibly smart, adaptive creatures and they quickly learn to manipulate us, especially when food is involved. This results in a role reversal: Fido has trained you that if he doesn’t eat, you will provide him with something more appealing to him. Ultimately, this is a completely losing proposition for dog owners. Fido will continue to hold out and up the ante until you are performing headstands in the kitchen and making a three course home-cooked meal that is laborious, expensive and likely significantly nutritionally deficient compared to dog food. This is why I strongly discourage owners from engaging in food fights with their pets. 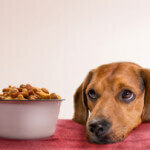 What to do if Fido is fussy about food? Ideally, the best feeding habits start early, when Fido is a puppy. Adult dogs can absolutely be trained to become more consistent eaters, too! When feeding, you should put Fido’s meal in front of him for no more than ten minutes. Whatever he doesn’t eat is taken away, and no additional food is presented until the next meal. This consistent, enforced, timed meal schedule will encourage your dog to eat when food is available. Fido will be more hungry, and hence more motivated to eat regularly if he learns that no food alternatives will present themselves. 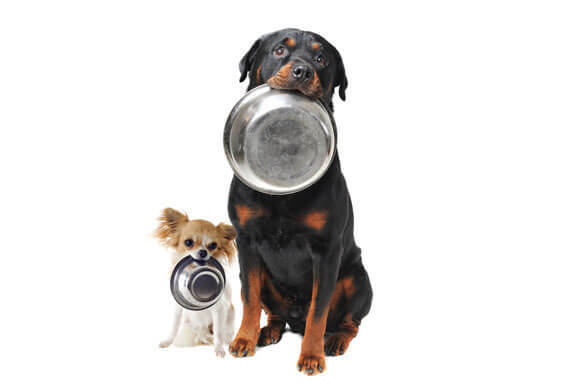 Your pup may not figure out the new feeding schedule on day one, but usually within a few days dogs are hungry enough to eat when food is presented. Trust me when I say that Fido will not starve if he misses a meal or two. He will not starve. Say it with me now: my dog will not starve if he misses a meal. 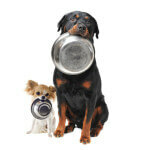 Teaching pets to eat meals on a schedule also eliminates the need for free feeding. I am not a fan of free feeding for many reasons. One, it is a major contributor to obesity in pets, as most animals overeat through the course of the day when food is constantly available. Two, it allows us to feed exact portions and know who is eating what and when (especially important in a multi-pet household.) Three, it eliminates the variable of one dog eating another’s food, and can mitigate inter-dog food aggression. It is important to note these rules may not apply if Fido has an illness, or if he is geriatric and debilitated. Many disease processes in pets are treated with specific foods; in these cases, alterations to feeding schedules should only be implemented in consultation with your veterinarian. Certain medications need to be given with food, and others on an empty stomach, so obviously meals should be timed accordingly with medication schedules. Finally, many of these suggestions can apply to cats but there are some vital differences with feeding our feline friends. Remember: cats are not small dogs! Cats, particularly those that are overweight, are prone to a life-threatening condition called hepatic lipidosis (fatty liver syndrome) which can occur if they don’t eat for several days. We cannot starve cats into eating what we want them to eat. 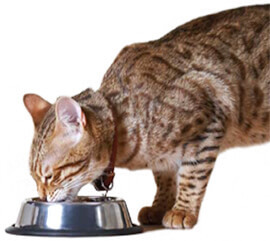 Changing foods and/or beginning a meal feeding schedule for cats must be approached very slowly, deliberately and cautiously as finicky felines can starve themselves when presented with new foods. In contrast to cats, dogs don’t run the risk of hepatic lipidosis, which is why the “tough love” feeding regimen is safe and effective. 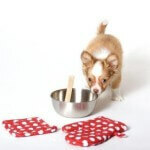 Don’t let your picky canine be the boss of your kitchen! You should dictate what Fido eats, not the other way around. I am a Community Helper!